Lecture | Silk Brocades, Embroidery, and Kesi | Skinner Inc. 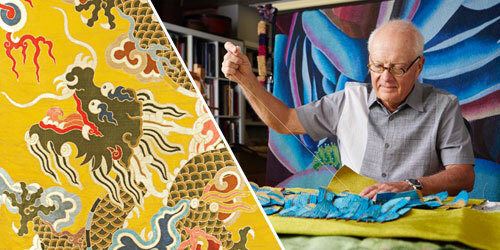 Considered by many to be the nation’s leading contemporary tapestry artist, Jon Eric Riis has perhaps more than any other artist taken the ancient craft of hand-woven tapestry to the level of important contemporary fine art. Often imbuing his subject matter with highly critical social and cultural ideas, Riis’ provocative art is as important for its content as it is for its stunning execution and unmatched technical prowess. Jon Eric Riis creates extraordinary works of woven silk and metallic thread with textured undulating surfaces of hand-stitched pearls, coral and glass beads. The meticulous works are supremely crafted, astonishing in visual effect and profound in concept. This entry was posted in Event and tagged art, asian art, event, free event, jon eric riis, lecture, textile by Skinner. Bookmark the permalink.